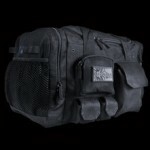 The Datsusara Light Gear Bag is a smaller version of our Pro Gear Bag but it still has enough room to carry gear for your various activities and enough pockets to keep things organized. Made from hemp canvas which is naturally anti-microbial, breathable, durable, and environmentally friendly. Mesh pockets that will fit up to 4 large water bottles, towels, etc.